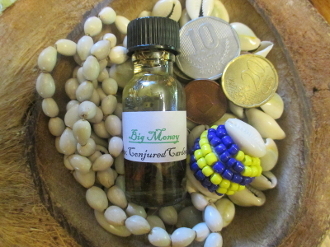 I've created this oil with cedar essential oil, a strip of dollar bill, bay leaf, cinnamon and pyrite to draw you the money you need! Use a green flannel mojo, a dixie John root, a blank check (your own, filled out for the amount you need), a nutmeg, cinnamon and a piece of candy. candy coins are preferred. Dress the check, filled out with the amount you need, with my Big Money oil and add all ingredients the bag. Care for as you would any mojo.